I was wondering what all your thoughts are on general/common indicators of the presence of Yowies in a given area are. I know tree breaks, tee-pee structures and wood knocks seem to be the big ones, but what else have you guys found in your adventures? Great question Stomper and welcome to the forum. I hope you get some replies. Id be interested to hear what some forum members have to say on the subject. Welcome Stomper.... Rock stacks are often seen and sticks that are placed in the shape of a cross. Thanks guys, it’s great to be here Rock stacks and stick arrangements are interesting ones too. I’ve read about bite marks a lot, but only ever in Bloodwood trees, which seems odd given the amount of grub-ridden trees we have in the bush, maybe it’s the type of grub they like or something? In all though, are there specifically common signs found in Yowie areas or is it just a consistent variety? Rock stacks are certainly intriguing. Of course humans can make them too, I met this chap once, years ago, who as a hobby would stack rocks as he came across them all over his property... and he lived on a rocky outcrop so had more than enough to play with... even his house was a rock house. He walked the surrounding hills a lot doing it as well. Footprints around creeks and rivers or other wet to dry areas. The sense of dread,paranoia or similar irrational alertness that seems to almost move towards you and then away to dissipate , in areas they attend. Screams in the night, some like a woman being hurt, high pitched and wailing, some more like a big angry man with an impossible and powerful chest capacity, baritone and laced with a rumbling that is felt as much as heard. Ape like sets of grunts, usually in three's and almost subtle in the background noise of the bush (not to be confused with pigs or Roos ect). Sometimes a sudden complete lack of sound in the natural buzz and chirp of bush land. Larger than humanly possible lozenge shaped theses piles (big reeking turds). Mainly the specific STINK of burnt unwashed purified death. Thanks guys, very interesting... and thought provoking. Do Yowies stomp much? Aside from Rusty222's video I haven't read or heard much on that. I ask partially because I had something in the bush stomp at me (hence the name). It was a rather suspicious event since I had stopped along a bush track for a few minutes before something stomped at me seemingly in protest and out of the blue (no sounds of something moving through the bush, before or after). There were no accompanying sounds of something moving through the bush as the stomps happened and the sounds didn't seem to move, so I'm sure it wasn't a kangaroo or wallaby hopping. There are strong signs of deer in the area, but I don't know much about their habits. My guess is that whatever it was was there just out of sight the few minutes I was there and stomped to tell me to move on. The bush was thick enough for something to hide in and inaccessible for me to reach due to an aqueduct between us, so I couldn't do much to investigate. Though nearly year on it still bugs me that I didn't do more to investigate while I had the chance. Hi Stomper. Thats interesting about the stomping you heard. From what i can tell, theyre able to get very close without making a noise until they want us to hear them for whatever reason. Possibly to scare us off/ move us along or gauge our reactions. Thats something i havent read or heard but from personal experience. I also believe they do zap people. Im sure some researchers are rolling their eyes but if your not dehydrated or on a high altitude and start acting odd then there is a chance your being zapped...and observed..imo of course. Your on the right track with therusty222! Why dont you just say what you mean Trevor instead of your usual gutless smartass b.s? Im sure youll come up with something smug TP. I actually really enjoy your posts and wish you would post more. Spitting the dummy and leaving the forum accomplishes nothing. I thought the point of this forum was to discuss yowies and their behaviour. Stomper has asked a question and i have answered it honestly with actual information i have deduced from a real experience. 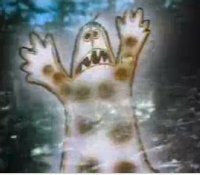 I realise we all have different opinions on yowie "signs" and some of our comments may appear foolish to others so feel free to say what you want but a general "laughing" imogee directed at no one in particular is pointless. I would suspect Dean would like us to encourage new members but that doesnt happen here. A dead forum now full of lurkers and disgruntled members. We cant always have things our own way. Especially if those "things" dont officially exist! Yowie bait wrote: Im sure youll come up with something smug TP. I actually really enjoy your posts and wish you would post more. Spitting the dummy and leaving the forum accomplishes nothing. during prohibition in America, except alcohol is not being decanted but ideas. Yowie bait wrote: Why dont you just say what you mean Trevor instead of your usual gutless smartass b.s? Thats right Tuckeroo, all we have is our thoughts and opinions in this game. Ive learned a lot from the forum about all sorts of things. I didnt think or was sure Trevor was having a go at me in particular. I was already upset with him for being a science killjoy on my orb thread and for not replying to my replies. I shouldnt be on the forum after a hot days work. I just make a fool of myself...as usua! Im genuinely sorry Trevor even if you are having a lend of me. I would agree with "paul" an unusual quietness in the bush. I have had an experience (unconfirmed) at one of my research locations were the while bush fell silent whilst walking along it was also accompanied by a low mumbling like people talking unintelligibly just on the edge of hearing. Wood knocks are common if they haven't been mentioned. And lastly I have had a very similar experience to yours were I was walking down a trail when I came to an overgrown section and was about to turn around when something went what I thought sounded like stamp stamp slap. I couldn't get into the spot due to a large thicket of parrot bush. Stomper wrote: Thanks guys, very interesting... and thought provoking. Amazing. Your story is pretty exactly the same as mine. I’m here because something big that I couldn’t see thumped at me. Hence the name. Thought someone would of mentioned the biggest pile of faeces you could ever imagine!! Seems like people witness 'mega dumps' in odd places that are beyond human capabilities....and reek accordingly. Hey all, sorry for the late reply, it's been a busy few months. it makes the prospect of encounters that more interesting... and confusing. Looking at all the ways people have tried to detect Yowies it seem that sound recorders are the most successful. I'm planning on using a few in the near future and I was wondering what you guys think of the Sony ICD-PX470 Digital Voice Recorder, since that seems the way to go. Hey Stomper , this is the one I use , they're very reliable and will serve you well for years . They will eventually loose their sensitivity . Hey Rusty! Thanks for the info! It's a bit out of my price range though... I just got my hands on an old Sony ICD-UX71 but realised that i can't protect it from the elements i thought of putting it in a zip-lock bag, but that won't protect it from moisture, and it does get cold, wet and damp down here a fair bit. What do you use to protect your gear? Thanks. Cheap option - tape it in a lunchbox with a hole cut in the end. Use a bit of plastic to cut up a splash shield and tape that on the outside - like a little awning over the microphone end. As long as it doesn't storm too bad you should be ok. The only way to really waterproof the main device is to use external microphones (i.e. glued into the walls of a container) so the main recorder is safe inside a water tight box. I saw someone do this inside a bit of PVC pipe with end caps. They had enough room for the recorder and an extra battery pack inside. They also had two mics 180 degrees apart, glued into the PVC and connected to the recorder inside with a plug-in cable. I think DaveR uses the lunch box option? Lunchbox with hole and awning , pretty simple and very effective , never had a problem . Roos and wallabies stomp to warn others of danger / communicate they are not happy. Yes, I know it wouldnt be a loud as a 300kg Yowie's stomp but I thought Id mention it to add to the info. Hey Doorway , Dave R has a video of a wallaby stomping right near his trail cam . It does it with two feet (obviously) and looks unco-ordinated because it has to regain it's balance . I've seen wallabies in the forest at night with the thermal and heard them stomping but it has nothing on the other stomping I've heard . In this video https://www.youtube.com/watch?v=aChOQmQ718k @ 2:20 seconds you can hear stomping live but notice the shuffling of feet or timing of feet to get the next stomping sequence in , thought it was interesting . In a live situation , you'll know when it's the real thing because of the weight of the impacts . Once you hear it you soon realise that you couldn't replicate the stomping sounds if you tried . Thanks Trevor and Rusty, I'll definitely give it a go! Doorway you do raise a good point about other animals stomping and this is definitely something I consider with my experience. Though whatever stomped at me did so in a very deliberate way as each stomp sounded identical and they were evenly spaced apart. Since the sounds originated from the same place the source must have been standing still (possibly ruling out a roo) which suggests perhaps a Samba Deer (they get to the size of cows) or something else which can stomp loudly without moving. Plus whatever it was didn't run away or make any sound at all before or after stomping, not even to snap a twig or crunch a leaf which i'd expect of a roo or deer. Rusty in your experience what kind of stomping have you had? Is there a common pattern to it? Also, do Yowies stick sticks (only about 1-1.5 metres long) into the ground? During several bush walks I've come across dead sticks standing upright out of the ground. They are always up to 2 inches deep, hardly ever have attached leaves or branches and largely appear to just have speared the ground after falling from the trees. Yet some are hardly aerodynamic enough for this, seem too small for the momentum required or are at a distance from the surrounding trees. Plus I've only seen them during the warmer months, once we hit winter there is nothing to be seen at all. Stomper wrote: Rusty in your experience what kind of stomping have you had? Is there a common pattern to it? There seems to be 2 types of stomping . 1 seems to be when you surprise them and as they run off there is multiple stomps and foot shuffling as they leave . The other seems to be a stationary stomp , always 2 stomps . As you said they don't move or make any other noise and they stand their ground , this has happened to me 4 times . As for the sticks in the ground , Neil Frost believes there's something to it and has found it on his front lawn . Apparently gorillas do it to mark ants nests . Hi, a while back I was at the back of my acreage property and there were 2 areas where around 6 trees were bent to the ground and interwoven together to create arches and a leafy roof, not far from these structures were 3 areas where sticks had been placed in circles (no sticks within the circles). I have a creek that runs alongside my property and there were some other signs also. In your investigations have you ever come across stick circles? 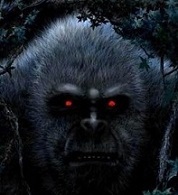 do you think Yowie's travel to different hunting areas? Thanks.